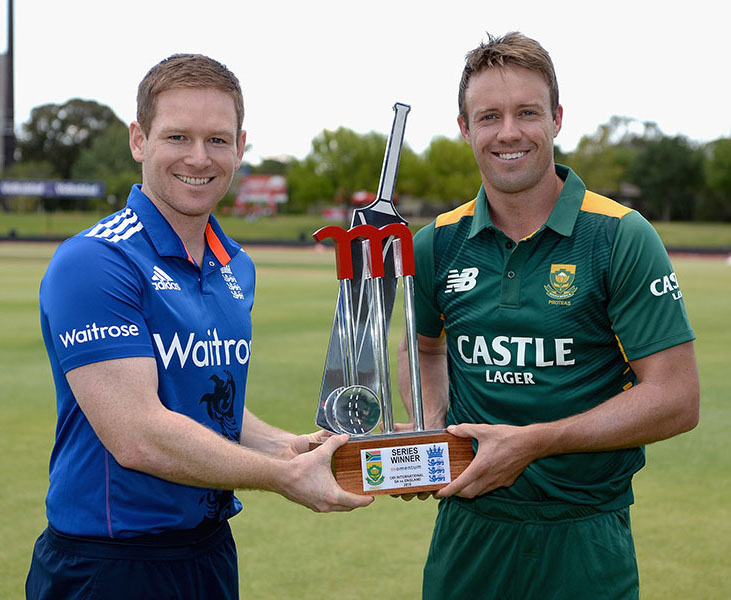 Eoin Morgan and AB de Villiers pose with the one-day trophy at Bloemfontein on Tuesday. South Africa will be keen to avenge a Test series defeat when they meet England in five one-day internationals, starting at the Mangaung Oval today (Wednesday). "There are no soft series or less important series, they are all important, particularly coming off a Test series loss," said South African coach Russell Domingo. Both teams will be looking to build on recent good results following disappointing campaigns in the 2015 Cricket World Cup in Australia and New Zealand. South Africa showed patchy form in the World Cup but reached the semi-finals, where they were beaten by New Zealand. Since then, they have won a home series against the Black Caps and an away series in India. England had a poor World Cup, failing to reach the knock-out stage after losing all their matches against other Test nations. But they then beat New Zealand 3-2 in a home series, lost by the same margin against Australia and beat Pakistan 3-1 in the United Arab Emirates. Several of England's leading one-day players did not appear in the recent Test series against South Africa, including wicketkeeper-batsman Jos Buttler, who hit England's fastest one-day century off 46 balls in the series decider against Pakistan in Dubai. Other new faces include captain Eoin Morgan, opening batsman Jason Roy and bowlers Reece Topley, Chris Jordan, David Willey and Adil Rashid, who all had some success in England's comfortable win in a warm-up match against South Africa A in Kimberley on Saturday. South Africa's one-day specialists include hard-hitting left-handed batsmen David Miller and Rilee Rossouw, all-rounder Farhaan Behardien and leg-spinner Imran Tahir. South African captain AB de Villiers, the world's number one-ranked one-day international batsman, will hope for a return to form after making three ducks in his last three Test innings against England. South Africa added fast bowler Marchant de Lange to their squad following the injury-forced withdrawal of Dale Steyn and the unavailability through injury for the first match of Kyle Abbott. "Marchant gives us more options with our fast bowlers because there is no Steyn, no (Vernon) Philander, no Kyle Abbott," said Domingo, who expressed concern about the workload of Morne Morkel and new star Kagiso Rabada. "The big concern is the fact that Rabada and Morkel have played a lot of cricket of late and have bowled so many overs, we need to manage them over the next few days," said Domingo. South Africa: AB de Villiers (captain), Kyle Abbott, Hashim Amla, Farhaan Behardien, Quinton de Kock (wk), Marchant de Lange, JP Duminy, Faf du Plessis, Imran Tahir, David Miller, Morne Morkel, Chris Morris, Kagiso Rabada, Rilee Rossouw, David Wiese. England: Eoin Morgan (captain), Moeen Ali, Jonny Bairstow, Stuart Broad, Jos Buttler (wk), Alex Hales, Chris Jordan, Adil Rashid, Joe Root, Jason Roy, Ben Stokes, James Taylor, Reece Topley, David Willey, Chris Woakes.